You use a nail file right? My personal favorite is the kiss lips, animal prints, shoes, or the latest fashion patterns. I can not imagine life without my nail file and pretty sure I don't want to. Let's tell the story of the nail file and appreciate what it does for our well manicured nails today. A nail file is a tool that is used to gently grind down and shape the edges of your nails They are used in manicures and pedicures after the nail has been trimmed. Nail files can be emery boards, ceramic, glass, crystal, plain metal files or metal files coated with sapphire. The sapphire is a finishing mineral that helps shape and give the nails a "polished" finish. Although the modern nail file appeared in the 19th century, evidence of nail file-like tools exist further back in history. Marie Antoinette (Queen of France) was known for her obsession of the 'lime à ongles' which was a nail file-like tool made of a pumice stone. Her perfectly shaped nails became the latest trend in the French Court of Versailles. 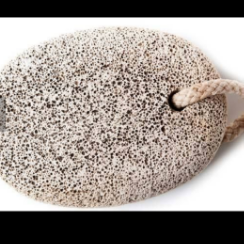 The pumice stone was later carved into a pencil like shape, which was used to trim and shape the edges of the nail. This tool would not be disposed after use, but would be hand washed in the bathtub to be used again. In the 1830's a foot doctor named Sitts created an 'orange stick' that was created from a dental tool women used to file down their nails. Before this invention, women had to use chemicals, various metals, and scissors to remove excess nails and shape them. Nothing feels better than newly manicured nails and a fresh coat of nail polish. We wouldn't have these luxuries if it weren't for its history and evolution. 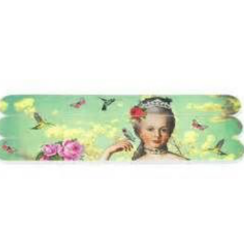 The next time you pick out your favorite patterened nail file think of it's story and Marie Antoinette's perfectly shaped nails!